As a prime contractor to NAVFAC EXWC, EEI provided a rapid assessment of the damage caused by the 2011 earthquake and subsequent tsunami in northern Japan. Not only was the damage from the tsunami devastating to the community, it also severely damaged the DFSP Hachinohe fuel terminal, pump houses, and associated parallel 16-mile resupply pipelines and booster pumphouses. The storm surge and tsunami wave completely submerged Pump House 2 (half way between Hachinohe Terminal and Misawa Air Base); this destroyed all of the electrical controls and rotating equipment and severely damaged the buildings and site. The entire Pump Station complex was covered with seawater, debris, and silt for a sustained period, which further complicated the damage. After the rapid assessment of the damage, EEI provided two design packages under a single delivery order to address the extensive repairs; one design package was used for bidding and construction by NAVFAC Far East and the other by NAVFAC EXWC. 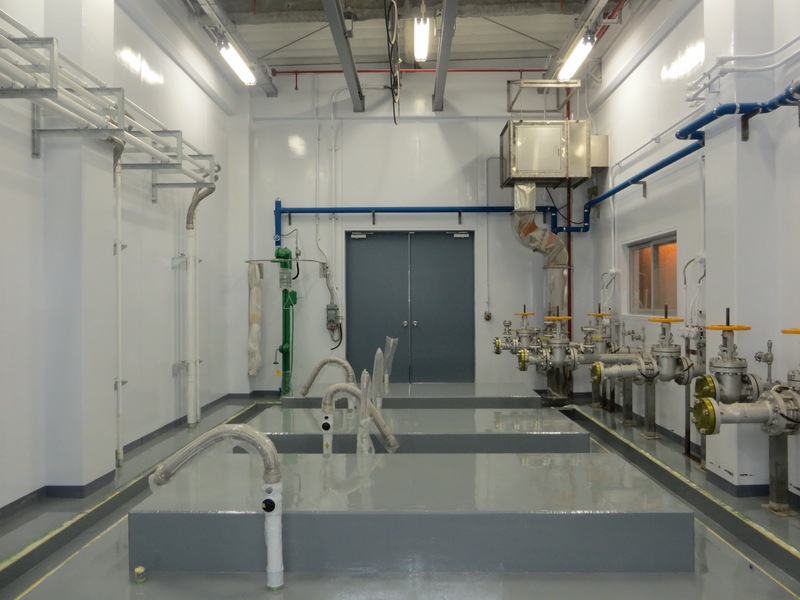 The package executed by NAVFAC Far East included all aspects of repair of the structures at Pump Station 2 (PS 2) including architectural (wall finishes, roof repairs, painting, windows, and doors), electrical (lighting, outlets, etc. ), site grade and pavement repair, plumbing (holding tank, plumbing fixtures, etc. ), and HVAC. Additionally, a new fire pump was provided, the existing fire piping system was repaired, and the fire alarm and control system was replaced. The second package provided repairs to the pipeline alignment, and replaced all of the mechanical (POL) and power components in PS 2. This included replacement of the three API 610 pipeline pumps, the emergency generator, and all of the controls. EEI used specific hydraulic modeling to determine the correct hydraulic inter-relations of the three pump station resulting in the proper pump selection for PS 2. Other key efforts included stress analysis and pipe replacement, and consideration for dynamic surge. The new controls included emergency power interlocks, motor starters, and variable speed pump drives. The pipeline repair also required extensive design of both underground and aboveground piping segments. The design included mechanical, civil, and cathodic engineering to replace several thousand feet of severely damaged pipeline. Formerly buried piping undermined by the wave had to be properly reburied and aboveground piping was so mangled that it had to be replaced. In addition, double-wall containment systems had filled with salt water; they were drained, dehumidified and re-sealed. Structural design of the pipeline repair included valve vaults, pipe supports, the Pump Station for the new pump pads, and the emergency generator building to install a new generator.